This week I welcomed student and adult leaders with the Washington Career and Technical Sports Medicine Association, based in East Wenatchee, and the Wenatchee School District. 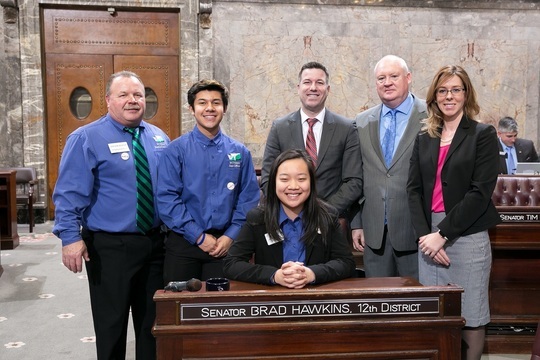 From left to right: Larry Howe, association executive director; Alex Medina and Sabrina Zhu, student leadership board members and Wenatchee High students; Dennis Conger, director of career and technical education for Wenatchee schools; and Diana Haglund, Wenatchee Learns coordinator. The education-funding plan just passed by the Senate would double the state support for career and technical education. This has been a busy week in the Legislature. The Senate took its first major vote of the year in an effort to take another major step forward toward resolving the 2012 state Supreme Court McCleary decision. I encourage you to keep reading for more information about the education-funding situation and hope you will share your thoughts with me as the discussion progresses. Also, as the fourth week of our session draws to a close, the first deadline of the session is drawing closer. Policy committees have until Feb. 17 to act on Senate legislation in committee, and I am glad that my most district-oriented piece of legislation this year will have a committee hearing well ahead of the deadline. I am proud of the Legislature’s progress on providing for education, which is our number-one responsibility or “paramount duty” under Washington’s constitution. Over the past four years, the state has provided full funding for all-day kindergarten, increased funding for school transportation and operating costs, supported reductions in K-3 class sizes, and delivered much-needed cost-of-living adjustments to educators. This year, we are working toward a solution to the remaining portions of the state Supreme Court’s ruling. The court found that school districts overly rely on their local levy dollars to fund “basic education.” This use of local-levy dollars to fund a state responsibility was found unconstitutional because basic education for students is a state-level responsibility. The Senate-approved plan would set a minimum investment per pupil and cap local school-levy rates across the state. Locally generated revenue would help fund the per-pupil investment; the state would cover the rest of the per-pupil amount, continuing the state’s role as the primary supplier of education funding. The Senate plan would also significantly increase beginning-teacher pay, which should help recruit more new teachers to this important profession. This shows what a flat local-levy rate would mean in the 12th District, based on the original version of the Senate’s new K-12 plan – the numbers in red represent a property-tax reduction, those in black a property-tax increase. 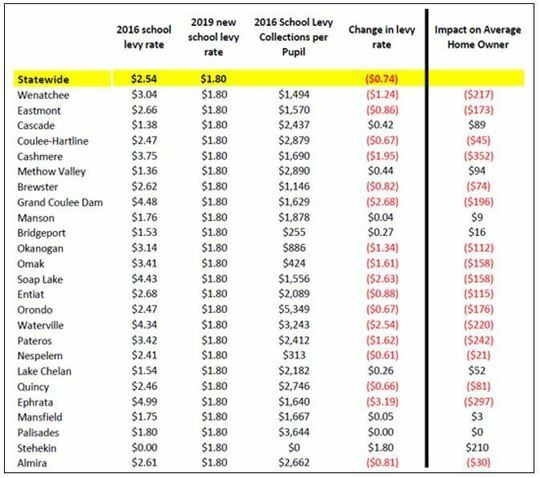 The Senate anticipates being able to lower the $1.80 levy rate, which could reduce tax implications for the areas with existing levy rates less than the newly-proposed rate. When it comes to votes on larger policy bills, especially at the beginning of a negotiation process, there are often provisions that people may not like. I recognize this, but to me, the primary importance of the Senate vote is the progress it represents in moving forward toward a final agreement and a more credible negotiation. What we don’t know yet is whether the House majority will approve a plan of its own – along with any tax increases associated with their proposals – or whether they will work from the Senate-approved plan for negotiations. Education policy affects our entire state, and I welcome all input from you, including questions, comments or concerns. My contact information is at the end of this update. The bill containing the Senate plan is Senate Bill 5607. More information about the Senate plan is available here. The House majority has proposed legislation that identifies changes in spending. The measure is House Bill 1843, online here. The approach presented by the governor in December exists as a policy paper, which is available here. The Senate education-funding plan was the main subject of my radio interview this week with KOHO radio. If you weren’t able to tune in Tuesday morning, click here to listen.